(Nanowerk News) Researcher Dr. David H. Hughes of the Air Force Research Laboratory in Rome, N.Y. is leading a team investigating long-distance, mobile optical links imperative for secure quantum communications capabilities in theater. Hughes and his Air Force Office of Scientific Research-funded team have conducted high data-rate experiments using an optical laser link, a tool which exploits the quantum noise of light for higher security. 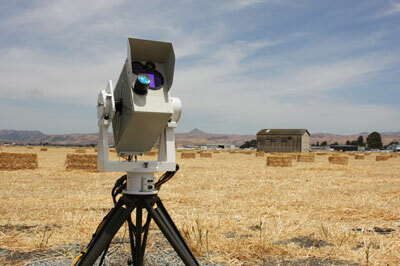 The system uses adaptive optics for transmission of high data-rate video and audio signals over long distances. Researcher Dr. David H. Hughes of the Air Force Research Lab (AFRL) in Rome, N.Y. is leading a team that is investigating long-distance, mobile optical links imperative for secure quantum communications capabilities in theater. AOptix Technologies, a developer of ultra-high bandwidth laser communication solutions for government and commercial markets has joined forces with AFOSR and AFRL to conduct flight tests at 10,000 feet to evaluate the performance of the high-altitude, air-to-ground, quantum communications links. Up to this point, the challenge with free space optical links, which use fiber optics for transmission have been the turbulence or distortions from temperature differences that cause motion or wind in the atmosphere. "When you transmit information through turbulence (motion in the atmosphere caused by turbulent cells or "wind") it's distorted just like the information coming from the light reflected off a distant, twinkling star to your eye. It's fuzzy," said Hughes. "You have to overcome that by using adaptive optics to rectify the distortion and get a better quality signal." As of right now, Hughes and his team have established an optical link without distortion in test situations at a distance of 35 kilometers in both stationary and flight situations. The next flight test will aim for increased altitudes to demonstrate further air-to-ground distances. "If we can now put one link on the ground and one on a demo aircraft, it wouldn't take much to apply the technology to operational aircraft for the Air Force," said Hughes. "This new capability may even save lives because it will enable the military to access ultra-high bandwidth ISR (intelligence, surveillance reconnaissance) information in real-time from various manned and unmanned airborne platforms," said Dean Senner, President & CEO of AOptix Technologies. The Air Force Office of Scientific Research, located in Arlington, Virginia, continues to expand the horizon of scientific knowledge through its leadership and management of the Air Force's basic research program. As a vital component of the Air Force Research Laboratory, AFOSR's mission is to discover, shape, and champion basic science that profoundly impacts the future Air Force. The Air Force Research Laboratory is the heart of science and technology for the United States Air Force. AFRL is responsible for developing the systems crucial to aerospace superiority. With a workforce of approximately 9,600 people, the laboratory's wealth of talented individuals help AFRL lead science and technology development through in-house and contractual programs. Additionally, the laboratory outsources approximately 75% of its budget to industry, academia, and the international community - leveraging the world's knowledge to provide the most innovative science and technology to the Air Force. AOptix Technologies is a privately funded company founded in 2000. With core technology expertise in the application of advanced adaptive optics, they develop free space optical communications and iris biometrics based identification solutions for both government and commercial markets. For additional information, please see www.aoptix.com.